Though I recognize this is proposed as a pilot, which I normally support, the impact on vehicular safety and flow would be too great. Staff are recommending removing the centre turn lane on Lakeshore Road between Guelph Line and Torrance Ave to paint bike lanes on the road. This would be a pilot project to test the effectiveness of the lanes and measure the impact of traffic safety and flow, in preparation for full road reconstruction next year. If the pilot is successful, the lines would be painted permanently when the road is reconstructed. The city’s Development & Infrastructure Committee will be considering the recommendation on Dec. 3, 6:30pm. You can register as a delegation to speak by contacting the clerks department at 905-335-7600 or online here. My Take: I am not in favour of removing the centre turn lane on Lakeshore Road for the safety of cars and good flow of traffic. The centre turn lane is essential for cars entering Lakeshore Road during busy periods from side streets and the condos on the South Side of Lakeshore Road. It is very difficult to make a left turn onto Lakeshore at peak periods because of the need to have a clear space in both directions at the same time. The centre turn lane allows cars to cross one lane of traffic, then wait in the centre lane for a space in the second lane of traffic. Further, during busy periods, the turn lane is needed to allow cars to move around turning cars to keep traffic moving. Though I recognize this is proposed as a pilot, which I normally support, the impact on vehicular safety and flow would be too great. We need to find alternative options for our cyclists, including New Street, the Centennial Bike Path, or repaving the sidewalk along Lakeshore. You are absolutely right about the serious dangers from “rat-running” cut-through car and truck drivers on Lakeshore Road. Although not their primary purpose, cycle lanes usually also have a significant traffic calming effect. Anyone who uses Lakeshore Road can attest that far too many car drivers are criminals who regularly commit serious Criminal Code of Canada criminal offences such as Dangerous Driving and Criminal Negligence with their aggressive, reckless, negligent and extremely dangerous criminal behaviour. These criminals regularly use the existing turn lanes to commit these serious crimes of violence. So let’s take these turn lanes away from them. Last year car drivers in Burlington killed 15 people by crashing into them and car drivers in Burlington killed another 30 people in Burlington by poisoning them with the lethal poisons in car air pollution. That’s 45 dead bodies, the equal to a major terrorist attack. One of the people poisoned and killed by car drivers was my father, Dr. Robert Love. He was my father and my business partner and my dear friend and every day I mourn his death – killed by car drivers. It is safe to predict that there will be another 45 dead bodies next year and another 45 grieving families unless we progressively reduce car driving and transform our transportation system into one based upon walking, cycling and public transit. The proposed improvements to Lakeshore road are a step in the right direction. I support the engineeering professionals on Burlington City staff who are recommending reallocating road space from car drivers to cyclists on Lakeshore Road. Why? Because I do not want myself and my loved ones to be dead or seriously injured. I do not want us to be hit and crushed by car drivers. I do not want us to be poisoned with lethal cancer-causing poisons by car drivers. I want to be alive, not dead. And I want the same thing for the 45 citizens of Burlington who will be killed by car drivers next year and every future year if we fail to take action today. Great idea. We need far more bike lanes. Multi-use paths are not safe for cycling – motorists don’t anticipate cyclists’ presence and its intimidating for pedestrians to have cyclists whizz by. This would be a terrible idea… as a person who uses lakeshore rd everyday, I know the necessity of the middle lane. I’m 100% with you on this one. I already complain about the number of cyclists on Lakeshore who think they own the road. I personally take the bike path when I am going downtown. Why did we put all the money into making the bike path ten times nicer if no one uses it? Agree removing the turn lanes on Lakeshore is a bad idea. A Pilot was done on narrowing Lakeshore by Spenser Smith Park and is now permanent despite the terrible traffic jams it causes every afternoon rush hour. Bicycles need a separate paved path. Yes, eliminating the center left turn lane in favor of a bike lane would impede the traffic on Lakeshore Road, but maybe that’s not such a bad idea. Unfortunately Lakeshore Road has become a viable alternative to Fairview and the QEW, roads which are far better equipped to handle traffic. As it is now, during rush hour it is nearly gridlock on Lakeshore Road because it is slammed with a long stream of autos as well as tractor trailers and fuel tanker trucks all trying to bypass the QEW or take a shorcut to get on the QEW toward Niagara. Wouldn’t it be nicer if these vehicles who are just passing through used the commercial roads and highways and left Lakeshore Road for the use of people who are heading to downtown Burlington or who actually LIVE on Lakeshore or its side streets? If you put in the bike lane and the traffic gets WORSE as a result, then many of these vehicles might stop using Lakeshore as an alternative to the QEW. I’m sure the residents of Lakeshore Road would surely appreciate a little less traffic. I believe everyone that comments here against the report recommendation should at least declare the last time they actually rode a bike on Lakeshore Rd. 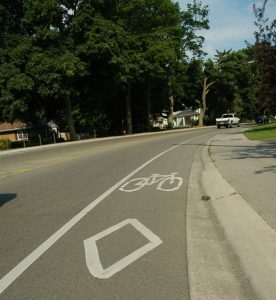 I will be very impacted by any change to Lakeshore Rd lane markings, and agree with the report, and comments from Susan72 and Chris Ariens to accomodate bike lanes. I am happy to be patient to turn left which for most times in the day and evening isn’t even an issue. During the commuting congestion times I already prefer to use a right hand turn route to get to my home. It is more important to know that cycling on Lakeshore Rd will be safer and more accessible. Also it will make it safer for pedestrians on the sidewalks that don’t have to step around cyclists that currently prefer not to use the road for lack of safety while commuting. Lakeshore public school is on this stretch of road and kid’s use the sidewalks to get there. Cyclists should stay on the road and be safe. There is an economic benefit as well given the rapid rise in cycling tourism that would be attracted to our waterfront and downtown. If we don’t at least try pilot projects we will never know. Councillor Dennison has proposed this pilot east of Guelph Line as well so there would be a longer stretch of cycle lanes. Centennial Trail is not safe for pedestrians that jog, walk with strollers or their dogs on leashes stretching across the trail when commuting cyclists moving much faster are travelling through. Cyclists belong on the road and deserve to commute safely. Perhaps then more of us will be inspired to use our cars less for daily commuting or to get downtown and lead healthier lifestyles. The city and region both are promoting active transportation master plans exactly to that point. It is contradictory to these plans if this pilot project is not supported. Big mistake to remove lane. It will make it hazardous to.bikes and cars . Why not use existing south side off road bike path? I think it would be a terrible idea to remove the center turning lane. Isn’t there already a bike path on the south side off road? … That is already safer. If you remove the centre lane it will make it hazardous for bikes as cars will have no room to give way for bikes.